Published: Sunday, October 12, 2014 at 10:07 AM. I was given an assignment by a reader, M. Bingman,to look into the importance of pets in the lives of senior citizens. More specifically, M. Bingman gave me an article pertaining to senior pets for senior people. The article, written by Carrie Miller, quoted a 2011 study published in the Journal of Personality and Social Psychology that said people with pets are less lonely and less fearful. Ms. Miller also referenced a study conducted by Purdue University School of nursing that found animals helped ease depression and could improve nutritional well-being by helping to keep people on regular eating schedules. The eating part does not surprise me. When one has the responsibility of feeding an animal one is more likely to think about meals for oneself. Going to the store to buy pet food gets the pet owner to a grocery store that has people food, too. Eating is also a social activity. For an older person who may be forgetful, if the pet is pestering them to go to the kitchen and get them some food, it may be the necessary prod to get that person to remember to eat. The health benefits of having an animal to look after are many. Social interaction is important. The pet gives the owner something to talk to as well as something to talk about with others. Sharing a love for animals and interacting with your pet is an important way to stay connected with the outside world. I look back over my last comments and think how clinical it sounds on paper. But anyone with a dog or cat knows it is about the bright eyes that wake you in the morning and look at you, purring and rubbing against you or doing a little dance to say “Where’s my breakfast?” There is the impatience your dog exhibits when he is waiting for his walk. (Yes, he has an internal clock that tells him when his walk is scheduled.) These are just the tip of the iceburg as any pet owner will tell you. The most amazing part of pet ownership is the unconditional love. With all the positives of pet ownership come some negatives. The cost of owning a pet may make it prohibitive for someone in retirement. The training and vaccines that go into raising a puppy or kitten can be insurmountable obstacles for the older pet owner. Older people are less likely to want to go through the ‘baby stage’ again, having to crate train a puppy or go in to the veterinarian every three weeks for three or four visits until the puppy or kitten is four months old. Adopting an adult pet could be the answer. In our area, it is not unusual to find adult dogs or cats that have been surrendered to shelters for no other reason than the owners are having to move and cannot take the pets with them. In researching this article, I discovered that our area shelters try to be sensitive to the needs of seniors who adopt pets. Panhandle Animal Welfare Society (PAWS) links pet owners who are over sixty years old with a group called Pets for the Elderly Foundation. They are a nonprofit organization whose “mission is to provide companionship to senior individuals through pet ownership while saving the lives of companion animals in shelters.” They pay the fees for adoption at participating animal shelters for senior citizens age 60 and older. Their web address is www.petsfortheelderly.org. I encourage anyone that is older and considering adopting a pet to look into these programs. There are other shelters in the area such as Alaqua that might also help a potential pet owner find the right pet. Have a question for Dr. Johns? E-mail her at JohnsDVM@aol.com. Write to Pet Peeves, P.O. Box 224, Valparaiso,, FL 32580. Johns is a Niceville veterinarian. 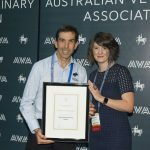 AVA Recognises Dr Michael O’Donoghue with the Meritorious Service Award Other Author Dr. Michael O’Donoghue was recently awarded with the prestigious Meritorious Award at the AVA Awards in honour of his extraordinary work for the Australian Veterinarian Association.